Tom’s life was turned upside down when he was diagnosed with end-stage liver disease due to non-alcoholic fatty liver disease (NAFLD) in the beginning of 2017. His condition worsened quickly to the point where he had no choice but to retire from his job in an assisted living facility. He was told that his only hope for survival was to receive a liver transplant. However, as he began to receive treatments to sustain his liver until transplant, his kidneys also began to rapidly deteriorate to the point where he will not only be in need of a new liver, but a new kidney as well. The cost of a liver transplant alone can be staggering. A dual organ transplant is that much more overwhelming, so he truly needs the help of his community in making it happen. Tom is a loving grandfather, father, and son. He grew up in Oswego, Kansas and graduated from Oswego High School. He worked as a draftsman in structural engineering for most of his adult life until he was let go. Like many in his situation, he went through a period of time not knowing what he wanted to do next. During this time, he learned how to crochet winter hats, and found that he had made so many that he didn’t know what to do with them. A friend was going through cancer treatment, and in the waiting rooms, he saw so many people with bare heads that were cold so he donated them to the patients coming for treatment. 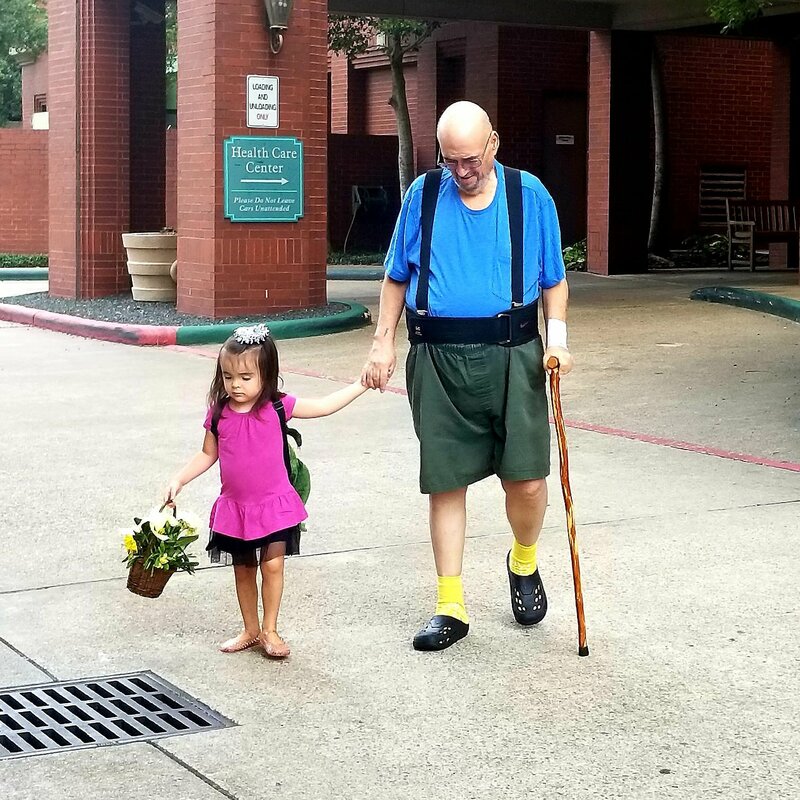 He then decided to become a certified nursing assistant, and he has worked in assisted living facilities in Sugar Land as a medical technician, a job where he has truly enjoyed spending time and having conversations with his many residents. Tom also enjoys spending time with his son & daughter-in-law, Greg and Michelle, and his 2 granddaughters, Hannah & Madeline (ages 6 & 3), his two “boogers”. He enjoys woodworking and solving problems. He built his first granddaughter her crib and a cedar chest, and he is waiting to get his strength back to build the youngest her cedar chest. Together, Tom and his family are committed to seeing him through this transplant. Family & friends of Thomas Curnutte are raising money to pay for uninsured medical expenses associated with both liver & kidney transplantation. Thomas has chosen to fundraise with Help Hope Live in part because Help Hope Live assures fiscal accountability of funds raised and tax deductibility to the full extent allowed by law for donors. Donors can be sure that funds donated will be used only to pay or reimburse medically-related expenses. To make a tax-deductible donation to this fundraising campaign, click on the Donate Now button. Hello family and friends! Since the last update on Tom was in October, there are a few things to fill you all in on. In November, Tom had his 3rd bout with hepatic encephalopathy (the brain confusion that can affect many with advanced liver disease) — he had to go back to the hospital for about 4 days, but thankfully, we caught this episode much more quickly and were able to start upping his dose on his medications before he even got to the hospital, plus there was no indication of any other infection in his body (which can also increase his risk of the confusion happening), so they were able to get it under control much faster. Praise the Lord it was a much, MUCH quicker experience than last time. Since then, he has been doing decently well, getting his paracentesis (abdominal draining) done once or twice every week, depending on how he is doing. There is one area, however, that has NOT been getting better, and this has become the current area of concern. Well, out of the blue, on our last two visits to the liver clinic, it was like they were seeing the true effect of the hernias for the first time — they could see he couldn’t walk well, sit well, stand well, that he is in continual, severe pain from them, and that he is not able to function independently in many ways because of these limitations. They recommended for us to at least come and talk with a surgeon because his quality of life has been so drastically reduced. The surgeon (who told us he was planning on denying Tom the surgery based on what he normally tells others) took one look at him and said, “We have to do the surgery. We can’t NOT do the surgery. At this point, there isn’t even room for a new kidney in there, so if you don’t have hernia surgery, you will not even be able to receive your transplants. Hernia surgery before transplant is now your only option. And it will still be risky.” So, long story short…..Tom is getting hernia surgery done in a couple months. Why in a couple of months? Before they attempt the hernia surgery, they need to do one other liver procedure to increase the chances of the hernia surgery going well — the procedure is called a TIPS (transjugular intrahepatic portosystemic shunt — feel free to Google). It will hopefully reduce the amount of fluid in his abdomen over the next couple of months to make it easier to do the hernia surgery with less complications. Why didn’t we do this procedure earlier? It carries with it an increased risk of hepatic encephalopathy, which Tom REALLY wanted to avoid, and quite understandably so. However, it is now not an option to avoid. SO….Tom goes in for his TIPS tomorrow morning at 9am. If all goes well, he will go back to see the surgeon in the middle of April to schedule the hernia surgery. After hernia surgery, he will probably be in the hospital for at least 2 weeks for recovery, due to his slower than normal healing time as a liver patient. * Please pray for the TIPS to go well and for Tom not to develop any hepatic encephalopathy over the next couple of months as a result. * Please pray for the hernia surgery to be successful. As with any surgery, there are risks. For a liver patient, there are more risks than normal. Pray for the surgery to hold, that there are no infections that develop, that his liver can stay healthy enough to handle the surgery, and that he can recover more quickly than they expect. That being said, Tom is more than ready to have this surgery done as the chances for success mean a much easier road for his continued wait for dual transplant, much less pain and discomfort, and an increased ability for him to become more independent during his wait. * Pray for peace and endurance for Tom and for our family. It continues to be a long, hard road with multiple twists and turns. We have no idea what to expect for the future, but we know God is faithful and good in the midst of the difficulties. Again, we thank you for much for your prayers, your support, your donations, your encouragement, and your love. We could not have made it through these past 2 1/2 years without you all and without the Lord walking alongside us through this journey. It’s been a few months since we last wrote, and to be honest, a LOT has happened. As you may have seen from the last update (which only covered the beginning of what happened), Tom went through a few really, REALLY crazy months. He developed a case of hepatic encephalopathy, which affected his brain and caused intense confusion, possibly due to an infection. His liver and kidney function spiralled, and he developed pneumonia, as well as other complications while in the hospital. 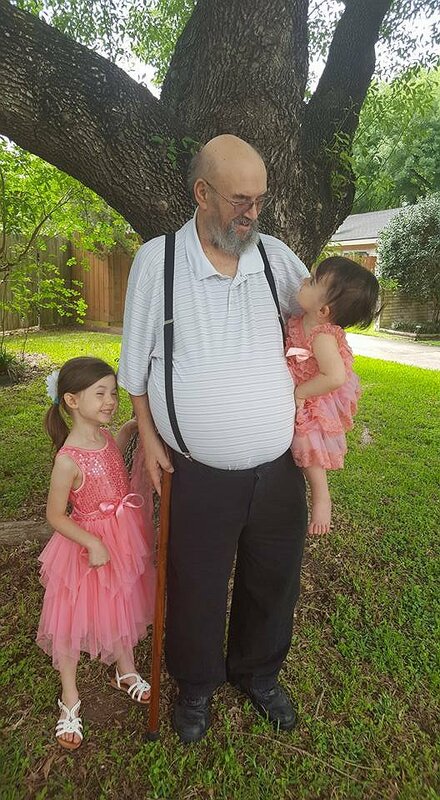 They finally got his brain confusion under control, but then it reoccurred while still in the hospital, prompting us to move him to the Liver Floor at the campus in the Houston Medical Center instead, so that they could stabilize him. There were attempts to get rid of multiple infections, to improve his spirits, and also an attempt at dialysis, which triggered atrial fibrillation in his heart, so that was discontinued immediately. He was on a feeding tube for quite awhile. It seemed like one thing after another. At one point, his condition was so poor that the transplant team deactivated him (not removed him) from the transplant list because he would not have been healthy enough to withstand transplant. He was, however, reactivated about a month ago. Overall, Tom was in the hospital for more than 5 extremely difficult weeks (from the end of June until the beginning of August), then he was moved to a skilled nursing facility for 3 more weeks (the rest of August) for physical and occupational therapy, as well as for continued healing from his ordeal. Thankfully, once they got all of his major issues under control and moved him into the rehabilitation facility, he dramatically improved. While he still has many issues due to his condition, he is doing as well as a person who has been waiting for a dual-transplant for 2 years can be doing. He is now officially active on both the liver AND kidney transplant lists. He is currently receiving paracentesis (draining of his abdomen) twice a week, and he has a nurse, physical therapist, and nursing assistant who visit him every week at his home. He is able to walk without a walker, and sometimes without his cane, and his spirits are considerably better as well, which is always a good thing! We are continuing to do small fundraisers as we are able to help cover the cost of all of his medications, his doctors appointments, procedures, and, of course, for the transplant itself. Thank you for being a part of his life and his story. Please continue in your prayers for him — they are immeasurable in their encouragement and effect. So sorry it’s been so long since we have updated you on Tom. It’s been a rough week and a half for him. Until this episode, he has been going to the hospital for his weekly paracentesis (draining of his abdomen) but maintaining at home. Two Wednesdays ago, however, he had his first bout with hepatic encephalopathy, a condition that can happen commonly to those struggling with liver failure – basically a form of confusion brought on when the liver cannot filter out toxins, primarily ammonia. While both of us were out of town, one of Tom’s friends went over to check on him and found him in a very confused state, so she called 911 and had an ambulance take him to the hospital where they found that a lot of his numbers were way “off” – ammonia, potassium, blood sugar, and heart rate. They admitted him to ICU in critical condition, but quickly worked to get him stabilized– by that Saturday, they had moved him to a regular floor and he was fully coherent. He was treated for an infection and for some dehydration (both of which could have played a role in triggering the high ammonia levels as well), and he is on the mend, albeit a slow one. He has been completely bedridden for the past week and a half, so the next step is for him to go to a rehab facility nearby for 2 weeks to ease back into normal daily life. He has wonderful doctors and nurses taking good care of him, so we are truly thankful for the care that he has received thus far. 8)	Some relief from financial stress related to medical bills – this will be a life-long concern for Tom, as he will have large medical bills for the rest of his life due to pre-transplant procedures/medications, the transplant itself, and post-transplant medications. If you would like to send him an encouraging card or note, please send them to Thomas Curnutte, 13502 Knottinghill Drive, Sugar Land TX 77498. We continue to appreciate your prayers, friends. Good news, friends! Tom has officially been listed for liver transplant (with kidney listing pending, depending on how it functions during the wait for his liver). Fortunately, his kidneys have improved a bit, so unless their function drops again, we are currently looking at a single-organ transplant. We are so, so excited about this step of being listed, as we have been anxiously waiting for it since his diagnosis in March 2017. We still have no idea on the timing of the transplant — it could literally happen at any time, although due to his blood type and the fairly “stable” maintenance of his liver at this point, they have told us not to be surprised if it is still a year into the future. So what does life look like right now for Tom? A LOT of waiting, constant blood tests and lab work, routine doctors visits (hepatologist, hematologist, endocrinologist, nephrologist….you name it, he’s probably seeing them), and weekly paracentesis procedures (draining fluid from the abdomen since the liver and kidneys are not able to drain it themselves). And as you can guess, all of this pre-transplant work is incredibly expensive. These procedures will continue on a weekly basis until transplant, which means that the cost will continue to be an ongoing burden. Without the weekly paracentesis, he would be in the hospital once or twice a month because of how uncomfortable it is to carry that much fluid. We are so grateful to those of you who have already contributed to Tom’s fund. We have been so blessed to have friends and family like you to help him through his journey. These funds have already helped to cut down on some of the overwhelming costs. Thank you for your continued generosity! May God's peace be with you Thomas! Lifting Tom up in prayer. He will be added to our church's prayer list this morning. Thank you for sharing this.